I’m now writing this from the Vietnamese city of Hue, along the central coast, but I did want to cover more about Hanoi since I spent over two weeks there. I’d read that there really aren’t any must-see attractions in Vietnam’s capital, at least in the sense that the Eiffel Tower, Statue of Liberty, and Christ the Redeemer statue are must-see attractions in Paris, New York, and Rio de Janeiro. 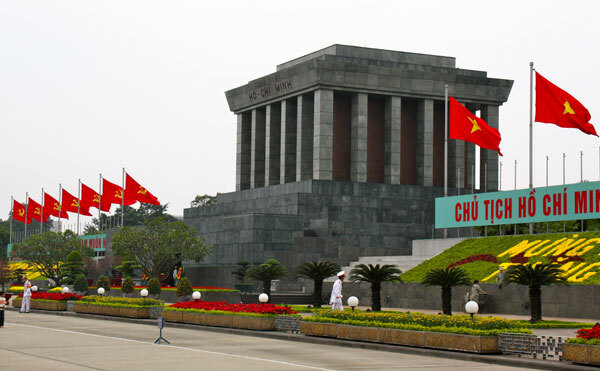 As far as I could see, that turned out to be true, but of course in a city of 6 million people that has been the area’s capital under many different rulers, and that was also celebrating its 1,000-year anniversary, there are at least a few worthwhile things to see in Hanoi. 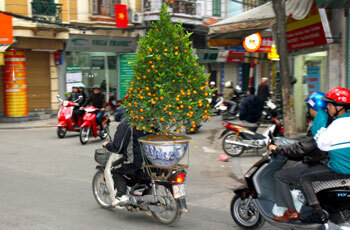 Tet, as you probably know, is the Vietnamese version of lunar new year, and the country goes wild for it. I arrived about 10 days before the big day, and after my side-trip to Sapa, I was back for the holiday and then for another week afterward. As previously described, Hanoi is a complete madhouse as Tet approaches, since each person is buying new things (like clothes and shoes) to make the new year as happy and as lucky as possible. And then starting on Tet day itself, the city gets relatively quiet, and it seems that about two-thirds of the businesses close down for the whole following week. That part seemed nice to me, and there were enough choices among tourist restaurants and small shops to keep visitors happy. A few more businesses seemed to open up every day, so it felt like an insane asylum slowing coming back to life. As I think I mentioned before, there really are no pedestrians in Hanoi, at least not local pedestrians. Honest to god, every single person scoots around on a motorbike or, if they are unlucky, a bicycle. The only people actually walking more than just a few steps at a time are tourists and old ladies (almost never old men) carrying those balanced stick carrier things. The result of this is we tourists stand out like sore thumbs even more than we otherwise would. Being a “well-fed” Westerner that is over 5’6” tall already makes you a target for a seemingly infinite number of xe om (motorbike taxi) or cyclo (bike taxi) drivers who are constantly calling out to you, but when you are also the only person on foot within a sea of motorbikes, there is just no hiding. After my first three days of this I was still finding it quite stressful. I have no problem saying “no” and/or ignoring people making offers, but when you have to do it literally every few seconds for as long as you are out and about, it gets old fast. So I discovered that wearing ear buds and listening to something pleasant on my iPod was a great solution. I still got constant pitches, but if I mostly looked down as I walked it became much easier to just tune the whole thing out. Still, you can see why a person wouldn’t want to just randomly wander the streets like you might do in New York or Amsterdam, so I picked my spots and usually did one touristy thing each day, spending most of the rest of my time trying out dining and drinking opportunities, or just hanging out in my fancy-but-small hotel room in the Old Quarter. I’d heard good things about this combination puppet show/live music performance, and with tickets being only $3 for the good seats, I decided to check it out, even though I heard it was best for children. I went to buy a reserved ticket early in my Hanoi stay and I asked for one ticket for the 2:30pm performance (there are about 6 shows each day). The crabby old woman manning the ticket both told me the 2:30 show was sold out, presumably because she wanted me to buy a ticket for a later show instead. But I had plans later, so I just thanked her and started walking away, and then she started calling out to me like we were haggling in a souvenir market or something. I came back and she said she had a ticket for that show, and I pulled out a 100,000 dong note (about US$5) to pay for the 60,000 dong ticket, and she insisted I pay with smaller bills instead. In case you haven’t spent much time in these so-called developing countries, everyone always wants you to pay with small bills. If I’m buying a 10,000-dong bottle of water then I know better to try to pay with a 100,000-dong note, but this was a damn 60,000-dong ticket, and this was a big cashier booth in a big and famous theater that sells these tickets all day long. In this case I didn’t have smaller bills anyway, so once again I just marched on down the street. Because of this (and the fact that it’s most recommended for children), I never went back. 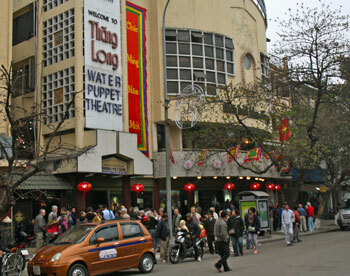 Screw that Water Puppet Theater and that old lady! Especially since this might actually be the most famous Vietnamese thing still in Hanoi (since Hanoi Jane Fonda lives in the safety and comfort of the USA), it was actually at the top of my list. It was a relatively short walk from my hotel, and only 10,000 dong (50 cents) to get in. I’d read that most of the former prison was demolished so they could build a glass skyscraper on the lot, and that is all true, though enough of the prison remains to get the idea. It only took me about 30 minutes to walk through and see the exhibits, and along the way I saw an American man who probably served in Vietnam (and maybe even in the prison itself) checking it out as well. I’ve heard that it’s a popular stop for Vietnam vets in Southeast Asia, and I can see why. The one thing I kept thinking about is that old saying that “the winners get to write the history books.” In this case, which is a rare one, the opponents of the USA were the winners so all the displays were wildly slanted propaganda, which I’m sure is also exactly what they teach kids in school as well. Interestingly, only a couple small sections were anti-US propaganda, and most of it was anti-French propaganda. A plaque in front described the way the French (who were running things in the late 1800s when the prison was built) destroyed a thriving craft village in order to build the prison. 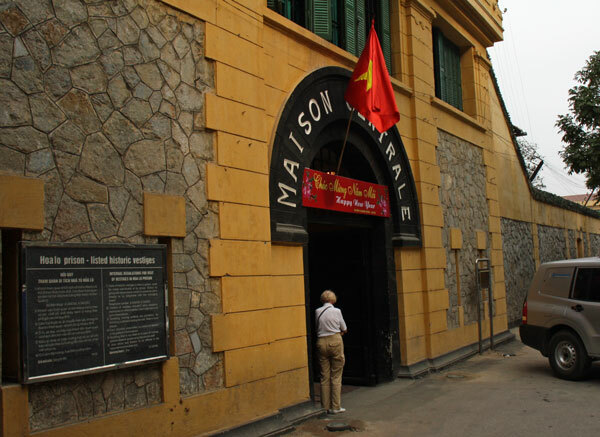 Inside it described how the French tortured and killed the Vietnamese revolutionaries who were prisoners there until the early 1950s. A real guillotine was one of the more sobering displays. The next section was a collection of photos of various people and groups demonstrating and protesting the war, which seemed fair enough, even though of course they don’t mention that to this day the locals aren’t allowed to protest anything themselves (or even use Facebook). Then near the end you get to the section devoted to the US pilots who were shot down in the area and kept at the “Hanoi Hilton.” John McCain was famously one of them, and his sworn accounts of torture and ill treatment don’t match at all with the photos on display there. 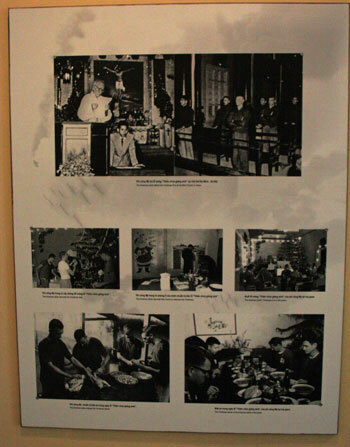 The prisoners are shown having volleyball games, receiving gifts for Christmas, enjoying cook-outs, and generally being treated like they were on a cruise ship. The only thing missing was Isaac, your bartender, pointing at you with both hands in the background before he mixes them up a pina colada. I’m glad the thing is smaller now than it was, as it made for a fascinating and quick visit. In the tradition of such communist leaders as Lenin and Mao, Vietnam’s favorite guy is still on display in the capital, in spite of him being dead since 1969. They call him Uncle Ho (no joke) and he seems to be as popular as ever. The mausoleum was about a 1.5-mile walk from my hotel, which turned into almost double that since I got lost at first. I reached the place just a bit before its 5pm closing time, and I joined up in the line of (mostly foreign tourists) who were there to pay our respects. The rules out front and in the guidebooks say no short pants, no laughing, and definitely no photos, so I was careful about all of those things. I didn’t know what to expect from such a strange sounding attraction, but heck, it’s free to enter and I had time to kill. The line shuffled along at about half normal walking speed until we actually started going up the front steps and entered the building. Everyone just walks in line, and the huge number of uniformed military guards in the area discourage you from any possible hi-jinks. Inside the building the line goes up another flight of stairs, and suddenly you feel some very refreshing air conditioning. It was a steamy February day so I appreciated the AC as much as Uncle Ho probably did. Around one more corner and you are in the room with him. Visitors are about 20 feet from his waxy-looking body, so you can’t really see many details. Evidently they close this thing down for 2 months late each year as the body is sent to Russia for maintenance. You enter near his head and walk down to the end of the room for a left turn, and then another left turn so you can see his other side, and you are done after about 20 meters total. A family in front of me slowed down for a quick moment and one of the guards tapped them to keep moving. I think that’s mostly so the line itself keeps going rather than them being afraid of a security breach. Honestly, I spent maybe 4 minutes inside the building, with less than half that inside the corpse room. Especially since it was free and air-conditioned, I didn’t mind much, but still you just never expect to be done so quickly at a major attraction. Once outside the mausoleum you can walk straight ahead to the Ho Chi Minh Museum, but I wasn’t really interested in that so I just skipped it and walked back to my hotel. One of Hanoi’s weirder attractions is something that doesn’t seem to be in all the guidebooks, but it interested me nonetheless. 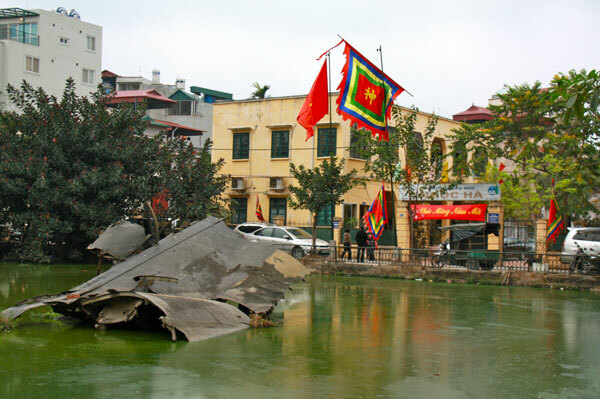 Evidently a B-52 named Rose 1 was shot down over Hanoi in late 1972, and it crashed into a lake in a residential area. The locals just left the wreckage sit exactly where it is, so it’s now a minor tourist attraction. This was quite a walk from the Old Quarter, and I might have skipped it altogether except I was feeling energetic on the main Tet day, and I figured I would barely be hassled my drivers and merchants on such a solemn holiday. Well, the city actually turned out to be way busier than I had guessed. My understanding was the Tet itself is spent with your immediate family, and later days are spent with other relatives and then friends and such, but in reality it seems like half of Hanoi spent Tet riding around on their motorbikes just like it was any other day. Many of them were dressed up, some even in suits, but traffic was crazy, though most cyclo drivers weren’t out, making it a bit easier to deal with for a foreign pedestrian. Not only was it a long walk, but the map on my iPhone couldn’t really convey what I was in for. When I got close it turned out that the roads I needed to take were no more than tight alleys, with enough room for me and one passing motorbike, but not two. There was plenty of traffic out there and I wasn’t even sure I was going in the right direction, so it was a weird feeling as I wound deeper and deeper into a suburban residential neighborhood. But just where the map said it would be, there it was. It’s not actually a lake, but more a drainage pond of stagnant water that takes up a city block and is surrounded by buildings. I was the only tourist there during that time, and from the looks of things, maybe for the whole day or week. It’s definitely off the beaten path. The amazing thing to me was what a lovely setting it is in general. There’s bright-green algae covering much of the “lake” and really interesting French colonial buildings surrounding it. I took about 25 photos and they are some of my favorites from the whole city, mostly for the colors. Shortly after I arrived an old man came out of one of the buildings and I’m pretty sure he was trying to invite me inside for food or a drink. I’d read that it’s very lucky to have a “wealthy” guest as your first guest in the new year, and though I’m not wealthy, my camera probably cost half as much as his house, so I guess I qualified. Unfortunately I couldn’t understand him at all, as he spoke no English at all and I still no zero Vietnamese. For all I know he was threatening to call the cops, but I do think he was actually inviting me in, which was nice, but I decided it would be too awkward to attempt to accept his invitation, especially since I couldn’t confirm what he was actually inviting me for. The walk back to my hotel was less stressful than the walk there, and that’s how I spent my Tet. 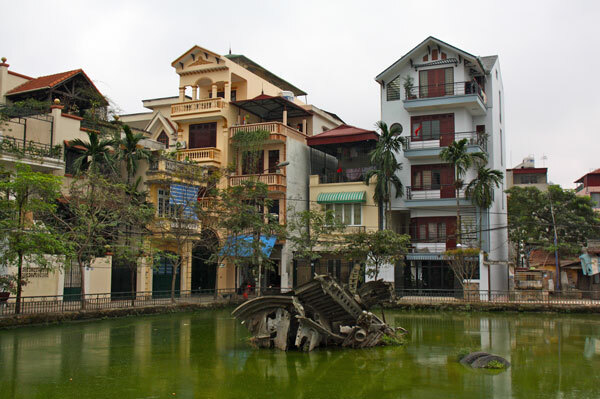 There are a few other notable things in Hanoi, including the lovely Hoan Kiem Lake that is just south of the Old Quarter, and I checked out a bunch of them, but none are really worth mentioning here. I had part of a day to kill between the time I checked out of my hotel and before the night train to Sapa left, so I went to see Avatar in 3D at a theater complex in a modern mall. Seeing the mall itself was quite interesting. The movie ticket was $5 and the mall was fairly posh and filled with young people, so Hanoi isn’t really the impoverished city that I was expecting. There are definitely people making US$10 and under, but honestly nearly every one of them seems to own a new $700 motorbike, so things aren’t all that bad for everyone. And just in case you were wondering, I was the only tourist in the theater, and the Vietnamese seemed to be rooting for the noble Na’vi savages and against the “American corporation” just as you might expect.